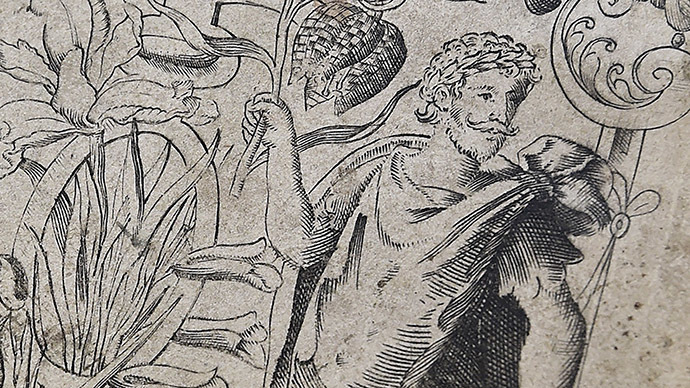 A historic botany book dating back to the 16th century showcases what may be the only known portrait of William Shakespeare drawn while he was alive, an academic expert says. Historian and botanist, Mark Griffiths, claims to have uncovered an “authentic” image of the famed playwright, poet and actor in a book about plants published over 400 years ago. The theory surfaced in an article published on Tuesday in UK art and antiques magazine Country Life. It remains the largest single volume work on plants published in English to this day. While analyzing the book as part of his research, Griffiths discovered it contained images of those who were involved in the creation of it. He noticed four key figures: an image of Gerard himself, two images of Gerard’s employers, and a fourth mysterious figure dressed in Roman-style clothing. The unidentified bearded man had a laurel wreath tied around his head and was holding an ear of sweetcorn. Griffith’s curiosity fuelled him to conduct an investigation to uncover the identity of the mysterious young man. During his research, Griffiths discovered the identities of each figure in the book were encoded with Tudor symbols. The code underneath the image of the “anonymous” man translated as William Shakespeare, according to Griffiths. “This is what Shakespeare looked like, drawn from life and in the prime of life,” he told Country Life. After cracking what he described as an “ingenious cipher,” or multi-layered code, Griffiths said the mysterious man in the illustration is Shakespeare when he was 33 years old. This image is the“only known demonstrably authentic portrait”of William Shakespeare. It was published for the first time byCountry Life magazine on Wednesday. Before the discovery, the only portraits available of the eminent writer had proven impossible to authenticate or had been drawn after his death. The most widely recognized depiction of him is from an engraving by Martin Droeshout, which appears in the First Folio of his collected works, published in 1623. “We have a new portrait of Shakespeare, the first ever that is identified as him by the artist and made in his lifetime,” he said. However, Professor Michael Dobson, Director of the Shakespeare Institute at the University of Birmingham, disagrees. “It’s a lovely picture. Everybody is fond of it,” Dobson said. However, he rebuffs the idea that the image is an authentic portrait of the famed playwright and poet. “He seems to be correct that the other three images on the title page are people associated with the book, so logically the fourth man must be a real person,” he said. Bate argued the reading of the archaic image as Shakespeare is “a stretch far from proven,” but the theory should not be discounted. He said it has more plausibility than other supposed Shakespeare portraits that have emerged in recent years.